[WTS] BitCoiner2012's Silver Selling Thread - Canadian Maples for BTC or PayPal! Bitcoin Forum > Economy > Marketplace > Goods (Moderators: malevolent, Cyrus, hilariousandco) > [WTS] BitCoiner2012's Silver Selling Thread - Canadian Maples for BTC or PayPal! Note: I will ship internationally if you pay the additional costs associated with it. If it absolutely must be, PayPal can be accepted. But expect me to charge fees or higher prices to cover the hassle costs associated with it. I am also open to bank deposits, money orders, etc for larger purchases or even moderate ones depending on how much hassle it is for me to take the payment. Good condition Canadian Maples from various years. Most in great condition, but will detail specific conditions of coins if necessary for the buyer. - 1 Ounce per coin. Looking to exchange for BTC. Can work out a deal for one or multiples, PM or post here. Also check my signature for a chance to win a Canadian Maple courtesy of myself and the games at http://TAABL.net either through a one time bet or an ongoing raffle. Here are some photos of the current maples I have. Some are nice and shiny, others have some small tinge. 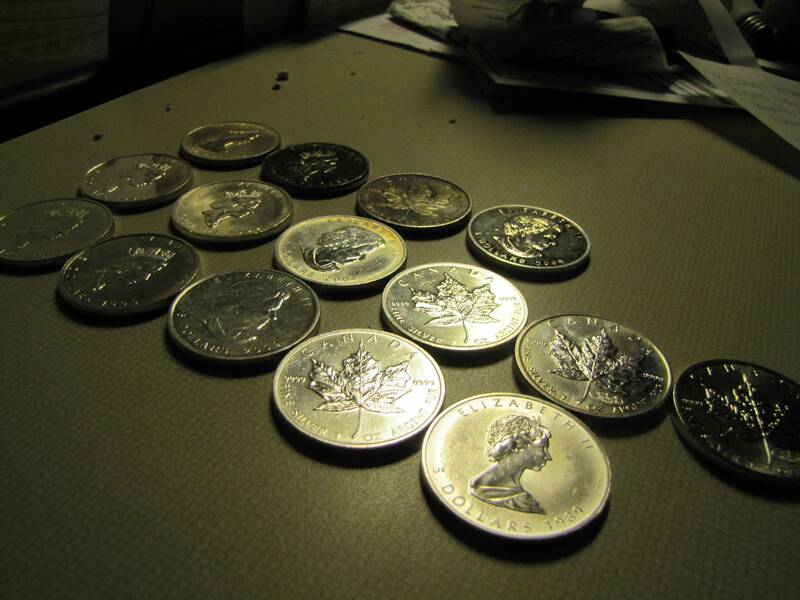 I buy for the content of silver and nothing more, barring mass disfigure of coins, so I expect to sell in the same manner. If that's not for you, no problem, some of mine are in visibly better shape, but those that want silver for silver, I also welcome your BTC business. Sorry I would post images exactly, but they are huge and take up tons of screen estate. Any tips on how to post small size? Is there a command to shrink them like HTML? Thanks..
How much over spot and for shipping? Can confirm receipt of payment. 2 Maple Rounds will ship tomorrow. Can confirm shipment of three packages for three users on this forum. DC numbers have been sent to respective PM boxes. There are no 2012 maples remaining, however there are varying years from 1990-current of varying conditions still available for sale, most in great shape. Will update the OP and provide more details of the conditions of inventory when I return from Thanksgiving. 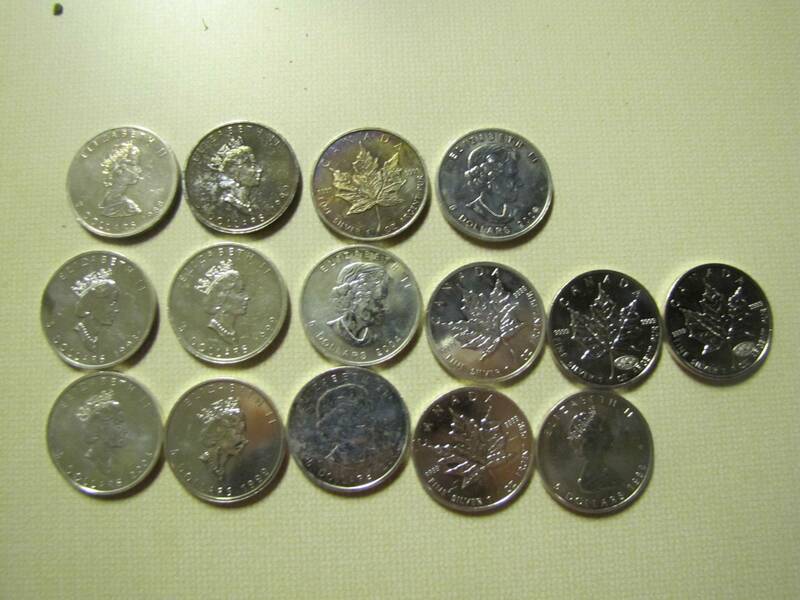 I ordered 3 maple leaf coins and they were genuine and in excellent condition. They also arrived quickly. Really couldn't ask for much more. Thank you! My 2 Maple Coins came in the mail, I am very happy with the order. OP updated to reflect stock realities. I am back in town and silver is available to those interested. Got my Maples, they are nice and shiny. I updated the OP with these images, check them out for an idea of the sort of silver I am selling. Re: [WTS] BitCoiner2012's Silver Selling Thread - Canadian Maples for BTC or PayPal! BEWARE: BitCoiner2012 is ignoring my numerous PMs and has not delivered his end of bargain for $750 Amazon GC. Hi - I am pretty sure that Bitcoiner is just very busy as he is also not responding to my PMs and I am trying to PAY him money as I owe him $500. So I do not think you have anything to worry about, other than he is away from the computer at present. Thanks for the assurance, Projects. I appreciate it! Contact with BitCoiner2012 has indeed been re-established, and I will update the thread once the issue is resolved. The issue has been resolved in the form of a refund as BitCoiner2012 has outlined in another thread. Thanks to all involved for your help in resolving this issue. Got my second set of 3 Maples. All are nice and shiny. Will buy more in the future! Always a pleasure with you! Thanks!